I do like my lentils especially cooked the South Asian way as as a rich luxurious dal, however there is one variety of lentil that I have never been that keen on – its the urad dal. 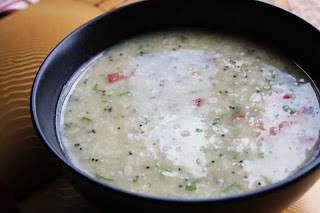 Urad dal can be found in three forms. It can be found whole known as black gram (kali dal), the creamy lentil still in its jet black skin. 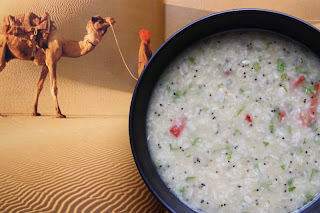 Then you can then find it split in half with the skin still clinging on (split urad dal); and finally the lentil is not only split, the black skin has been completely removed exposing its pearly cream interior, known as urad dal. As I've not been that keen on its gluey paste like consistency and the musty smell in the past, I thought I’d give it another try again, this time with the inclusion of poppy seeds (khushus in Urdu and Hindi) and lots of coriander. Poppy seeds tend to get used in my cooking in sweet baked dishes, not savoury ones, so I was quite curious to see how I found the poppy seeds in place of the traditional black mustard seeds. This is a rich and full bodied soup, D described it as a ricey-semolina texture like soup and said it was just okay. 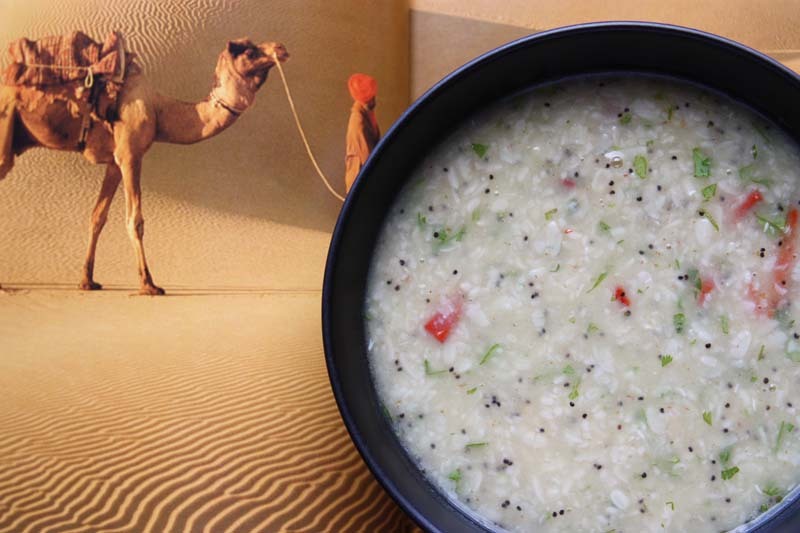 On cooking, the urad dal does not look that appetizing. It was very pasty in colour, this affirmed my negative attitude towards it, but when the poppy seeds and coriander went in it, it became appealing. The flavour and texture blending better a day later too. However, I am not a convert. I liked the crunch and pop from the poppy seeds and the punch from the coriander, but I have to agree with D it was just okay. But please don’t let my prejudices influence you, you may like it. 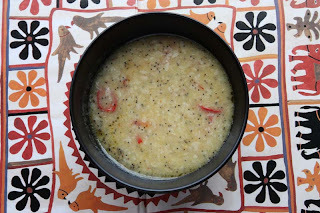 I know some of you are not that keen on coriander, so feel free to omit it, but I personally like its intense lemony citrus herby burst and for me this urad dal is so much better with it. I would suggest serving this with naan bread or ladled over a bowl of Basmati rice. This is my entry for this month's No Croutons Required (NCR) which is being hosted by Jacqueline this month. NCR is a monthly vegetarian food blogging event, where readers are challenged to create either a soup or salad incorporating a specified ingredient. NCR is alternately hosted between the Jacqueline of Tinned Tomatoes and Lisa of Lisa's Kitchen. The essential ingredient for August is lentils. 200g dried urad dal, washed and rinsed well. Put the lentils in a wide pot with the garlic, ginger and chillies and add enough water to cover them. Bring to a boil, then turn the heat on and simmer for 30 – 40 minutes. You will need to add more water as the lentils thicken, stirring now and again to prevent from sticking to the pan. When the dal is tender . In a frying pan, melt the butter with the garlic and allow to sizzle until just turning golden, then stir in the poppy seeds and toast for a minute. 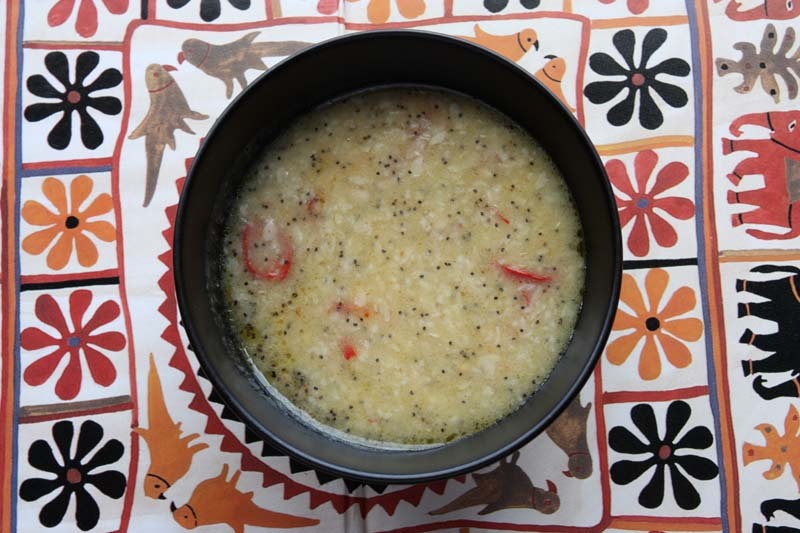 When the dal is cooked, stir the garlicky-poppy seed oil into the cooked dal, then stir in the minced coriander. Taste and adjust seasoning if necessary and garnish with coriander. Must be a regional thing but urad dhal to me is the one with black skin left on. And I'm so surprised that you don't like it - I cook it with fennel seeds and it's soooooo delicious served with hot rotlis. Though looking at your post on yummy sounding okra crisps maybe I can understand why - it's gooey just like a good okra curry. Yes it must be, also a country thing. Its so funny as I love this lentil with its black skin on, but not without it. I may tray again in the future with fennel seeds. And its so funny you think it may be related to my approach to okra - I think you may be right. Warm wishes and i hope you settling in your new home. I'm a latecomer to urad d(h)al, I didn't get to try it until I moved to North Lincolnshire (where I have a really good grocer who stocks a dizzying range of pulses, spices and vegetables like dudhi, karela & eddoes). I love the sweet musty aroma, though I agree with you, the colour can be offputting (so I usually put silly amounts of coriander of perpetual spinach in it!). I look forward to making this recipe! Isn't it great to have a good grocer! I have to say I can't share you liking for the musty aroma. I find it off putting like the smell of chardonnay and Parmesan cheese. I do hope you make this recipe, I have a good feeling that you will like it. PS Loved you da(h)l. Daal is a funny word - I never know how to spell it, so it changes all the time!